PROVIDENCE, R.I. - Four players recorded multi-point games as the No. 11/10 Providence College men's hockey team snapped a three-game winless streak with a 5-1 victory over Brown University in the 33rd Mayor's Cup on Tuesday night at Meehan Auditorium. Meehan Auditorium - Providence, R.I.
- The Friars struck for four goals in the opening 9:00 of the game to take control early. - Kasper Björkqvist got things started with his 10th goal of the season as he gave the Friars a 1-0 lead on the power play just 3:08 in. - Greg Printz made it a two-goal cushion 39 seconds later with his eighth goal of the season and first since Dec. 7. - Josh Wilkins continued his torrid pace as his wrist shot chased Luke Kania from the game and gave Providence a 3-0 lead. It was Wilkins' ninth of the season and third goal in as many games. - Jack Dugan tacked on Providence's fourth goal of the game 40 seconds later as he slipped a forehand deke between the pads of Gavin Nieto for his eighth goal of the season. - The Friars extended the lead once again just 2:18 into the second period as Scott Conway notched his team-leading 12th goal. 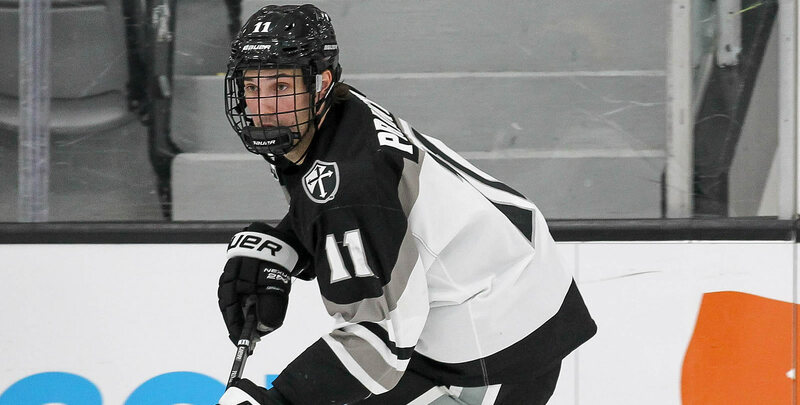 - The teams combined for only seven shots in the third period and the Friars utilized all three goaltenders over the final nine minutes of play. - Brown broke the shutout with 5:29 to play on Tristan Crozier's unassisted goal. - Gabe Mollot-Hill (2 saves) and freshman walk-on Jimmy Scannell (2 saves) each appeared in relief in the third period. - Wilkins extended his career-long point streak to 13 games (7-12-19). He leads the Friars in scoring with 26 points overall and has scored a goal in three-consecutive games. The point streak is the longest in the NCAA this season. - Providence improves to 7-3-2 on the road this season and is tied for the national lead with Bowling Green in scoring offense on the road this season at 3.75. - Conway now has nine goals over his last eight games. - The Friars have outscored the Bears by a 16-1 margin over the last three Mayor's Cup games and have held the trophy since the 2015-16 season. - Jason O'Neill registered his first two-point game since Nov. 24, 2017 against Maine in the Friendship Four in Belfast, Northern Ireland. 1-0 (PC) - 3:08/1st - PP - Kasper Björkqvist (Mirageas) - Rebound off a shot from Mirageas that rang off the post. 2-0 (PC) - 3:47/1st - EV - Greg Printz (Bryson, O'Neill) - Centering feed from the half wall by Bryson to Printz in the slot for the snap shot blocker side. 3-0 (PC) - 8:20/1st - EV - Josh Wilkins (Dugan, Bunz) - Off a chip into the zone, Wilkins collected and fired a wrist shot over the glove of Kania. 4-0 (PC) - 9:00/1st - EV - Jack Dugan (Printz, O'Neill) - Deke on the forward in tight between the legs of Nieto. 5-0 (PC) - 2:18/2nd - EV - Scott Conway (Bryson, Young) - Drop pass from Bryson to Conway who ripped a wrist shot under the crossbar. 5-1 (Brown) - 14:31/3rd - EV- Tristan Crozier (unassisted) - Turnover in front of the Providence net and Crozier tucked a shot under the arm of Mollot-Hill. The Friars make a return trip to Chestnut Hill on Saturday (Jan. 19) looking to avenge last weekend's 4-2 loss to Boston College.